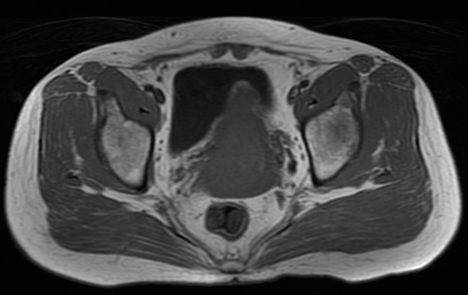 This 48-year-old woman presented with new-onset vaginal bleeding between menses for more than two months duration. Following ultrasound and the MRI herein illustrated, the patient underwent surgical treatment of her condition. Scans were acquired at 1.5 T utilizing an 8-channel body coil. (A) Axial pre-contrast spin echo T1-weighted (TR/TE 460/7 ms, 320×192 matrix) along with (B) axial and (C) sagittal fast spin echo T2-weighted (TR/TE 3760/131 ms) images were acquired, in addition to (D) sagittal post-contrast spin echo T1-weighted images. All scans were acquired utilizing a slice thickness of 6 mm. 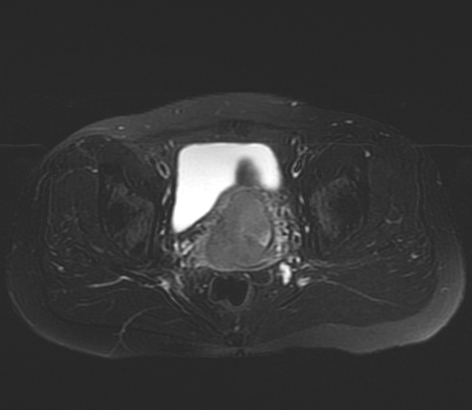 The uterocervical junction is markedly deformed by a large soft tissue mass resting posterior to the urinary bladder. This mass demonstrates moderately high signal intensity on T2 and low signal intensity on pre-contrast T1WI. 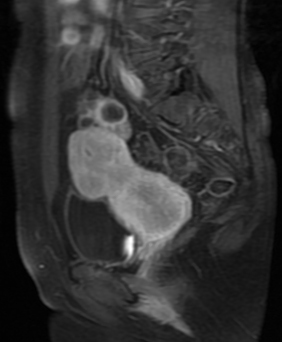 On post-contrast images, the lesion enhances avidly. 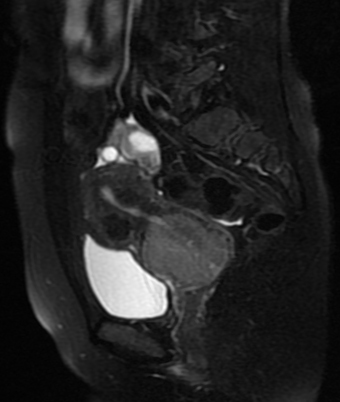 In addition, portions of the posterior wall of the uterus enhance, indicating secondary uterine involvement.